The ancient serial port which is no longer found on the latest motherboards and even the not so latest laptops is still used for connecting to the console of networking devices, headless computers and a lot other applications. On computers which do not have built-in serial ports USB-to-Serial adapters can be used. Linux identifies inbuilt serial ports as /dev/ttyS0, /dev/ttyS1,….. /dev/ttySn and USB-to-Serial adapters as /dev/ttyUSB0, …. /dev/ttyUSBn and they can be accessed using terminal emulator applications like PuTTY, minicom and screen. Normally when the serial console is accessed using the terminal emulator of your choice as a non-root user you’ll get a “permission denied” error. 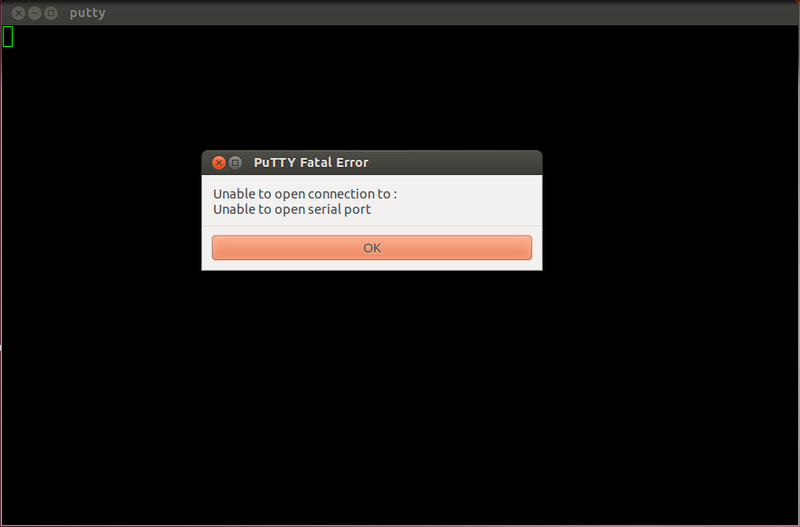 Using PuTTY on Ubuntu I got the following error – “Unable to open connection to: Unable to open serial port“. This is because the device file of the serial port does not have permissions to allow to currently logged in user to “read” or “write” to the serial device. The following command will confirm that. So we can see that only the “root” user and the “dialout” group have proper permissions, while chmod can be used to grant access to the required user or everyone it is messy and not a secure way. The easier way is the add the user to the dialout group. First verify if the user does belong to the dialout group using the “id” command. Next add the user to the “dialout” supplementary group. You have to logout and login before changes take effect. After logging back in try the “id” command again. Now all your terminal emulator applications will work with the serial port without any issues. Hi there! Thank you for your EXCELLENT aids. Simple and VERY informative. I’ve managed my serial port to work with my vinyl cutter thanks to this! 🙂 Have a nice day! If you didn’t have the dialout group there is no use of adding it. You should check the group ownership of the serial port with any of these commands. And then add your user to that group. I have a bluetooth sensor device,(which connects to com* port in windows), it is connected to /dev/rfcomm* in linux. I am able to see some data coming if I did sudo cat /dev/rfcomm*. Also, I am able to view the data on /dev/ttyS* if I did sudo ln -s /dev/rfcomm0 /dev/ttyS99 and sudo cat /dev/ttyS*. However, I am unable to open the file through serial emmulator like putty, and hence(apparantly) I am unable to open the file in my MATLAB code(which is my final aim). It would be helpful if you could suggest a solution. I haven’t tried this before but I think entering the following command will solve your problem. Replace 0 with the number in /dev/rfcomm* and keep this terminal running. As i read your question, i can see even I am facing the same issue. I have a bluetooth sensor connected to windows and data is passed to serial port COM23. I have java code which reads this serial port and echo data on screen. I am trying to run same java code on ubunut 14.04 but its not working as it does not find COM23 there which is obvious. 1. Directly read bluetooth data on ubuntu and write it to some file which will be then read from java code. 2. Pass bluetooth data to serial port as i did it on windows and then read serial port. Write serial port data to some file and then read that file through java code. also tried to create sym link between bluetooth and serial port but none is helping much. I need to burn my .hexfile in to 89v51rd2 microcontroller. I am using UBUNTU 12.0. please let me know how to connect or map the USB to port. I have to use USB to serial converter. Thank you sir, you made my day! Nice one. This is exactly what i needed. after waisting 72 hours searching the internet I found this, which solved everything! Thank you so very much. It’s so hard to find simple language along with examples in solving these types of problems. I am very grateful! Good comments , I learned a lot from the specifics . Does anyone know where my assistant would be able to get access to a blank a form document to fill in ? You saved my morning (and a lot of my time). Thank you for this! I’m new to Ubuntu / Linux Distro. I’m trying to install Reliance 3 data card to work through GUI mode. I was able to install it able to install it and can see it listed under Internet folder. While I try to launch it says “Cannot Access Serial Port. Make Sure you have appropriate permission”. Followed your thread and added myself to the dialout group and relogged, still same. Please help. Thanks worked well for me using xubantu on an old Eeepc to get cleanflight running.